Imagine you had to make the most accessible conference ever. What would you need to consider? Venue, Price, Location, Cost, Childcare, Catering, Event recording, Admission. Can you imagine plotting these on some spider graph and watching as the cost of providing X doubles Y, and decisions are made which trade on part of accessibility for another. Which requirements are legal, which requirements are moral, which requirements best reflect the spirit and soul of the conference? On March 29th last year, Pat Lockley and Natalie Lafferty helped to organise PressEd conference. PressEd took place solely on twitter. Lecturers, educational technologists and students got together to share knowledge on how they used WordPress for teaching, learning and research. WordPress is an open source content management system which is estimated to provide hosting for 20-30% of websites. Talk of doing a WordPress conference in the UK (wpcampus.org is similar) had been going on for over six years. Several attempts had been made, and returning to the criteria, a match of location and venue had proven to be too big a hurdle. Then, when one of the organisers heard of PATC, eureka! No venue, no location. 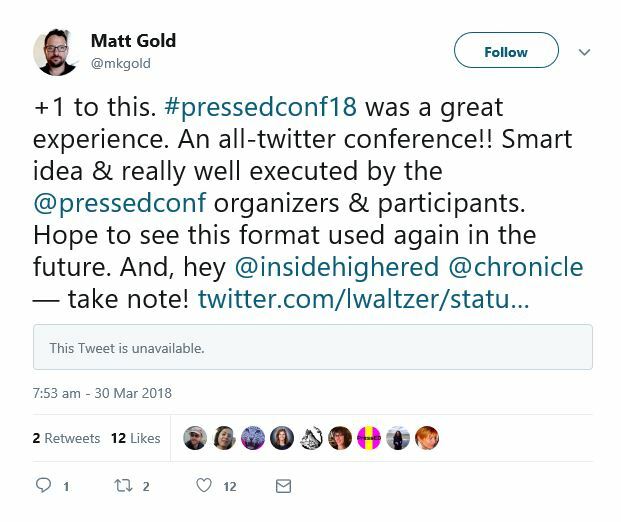 Twitter conferences are relatively knew, and we believe PressEd was the fifth. The list (as far as we are aware) is #IconTC , #UPMTC, #PressTC, #PATC and #PressEDconf18. PressEd was very much inspired by PATC. Twitter conferences remain new and somewhat alien, however people seemed relatively keen to submit proposals (which in twitter style had a 280 character limit). We ended up with over 50 submissions for presentations, which with some peer reviewing we reduced down to 40. On the day this meant we had 46 sessions. We felt the conference could work with 20 sessions, and wouldn’t be sure if we’d had more sessions whether a twitter conference could have parallel streams like physical conferences do. We wanted to run for 12 hours on the day to create a broad time window for people in different time zones and with the scope to present outside of working hours, should that be necessary. Each pressEd presentation was allotted 15 minutes (keynotes had 20 minutes) to share their knowledge, with guidance of one tweet per minute. PressEd ran for over 12 hours on the day. Our keynotes included two professors – one of whom has published research on the benefit of WordPress to academia. 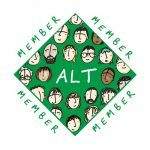 How much did it cost – well ignoring the organiser’s time – there was $12 dollars for web hosting, $45 dollars to set up our email to avoid spam filters, £120 pounds of book tokens to thank the keynotes. So in total, we’d spent approximately 150 pounds to run a conference, which is comparable to the cost of conference admission. Is this a fair comparison? Our first keynote tweet by Professor Gurminder K Bhambra was seen by over 11000 people, which are tedX level conference numbers. From the twitter analytics data we’ve seen, presenter’s tweets regularly achieved over 1000 views on the day, and those tweets still exist and are effectively instantaneously archived. On the day before the conference, one account had 688 twitter impressions, on the day of the conference that jumped to 6000. The key question is – are twitter conferences comparable to “physical” conferences? How would we compare? I offered some possible metrics at the start but these could be seen as functional and not satisfaction based. 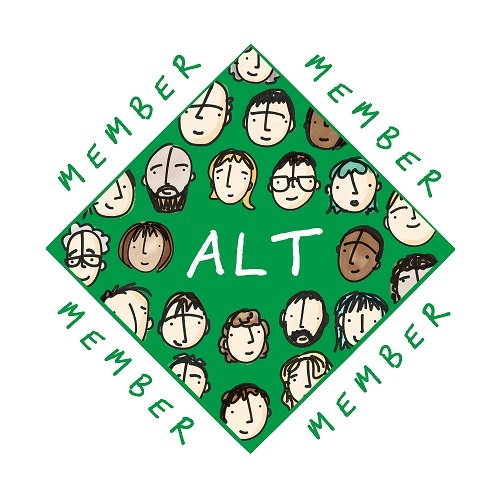 However it remains valid to ask if the benefits of twitter (no travel, no catering, no venue, almost instantaneous networking, no fees, sessions recorded as moments – offer greater chances for participation that outweigh potential satisfaction measures for those able to attend. Open access has been facilitated by cost discussions, citation metrics and download stats, but these arguments don’t seem to have been applied yet to conferences. Some conferences are virtual, but there remains many technical issues with live streaming which twitter bypasses. We cannot claim to have unearthed a panacea. Although 50% of our presenters where female, only one presenter based outside the UK, USA and Canada. Only two presenters didn’t have english as a their first language. These are things we are working on (https://twitter.com/pressedconf/status/988788237912199168) and looking to improve. For pressEDconf19 we’ve got call for papers in 10 languages, we’ve got a mentoring site to help people develop their ideas and a top tips site to help people finesse their presentations. 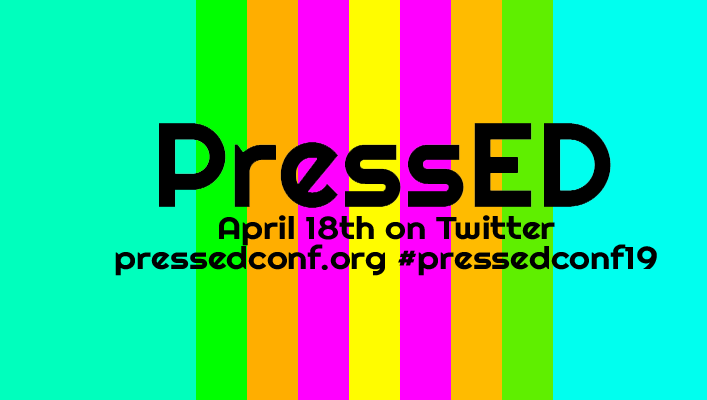 PressEDconf19 is happening on April 18th 2019. The call for submissions is open and you can submit up until March the 9th. We’d love to hear your thoughts on pressED and we’d love a submssion too.